Agents of SHIELD = Lazarus? 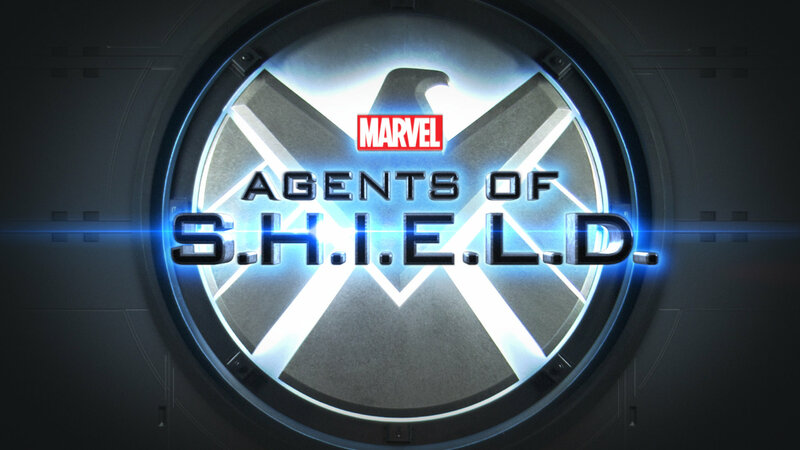 If you read my previous posts about Agents of SHIELD, I’ll forgive your surprise at seeing another one. It would be a bit harsh to say that the show should have been buried after the end of last season, but it certainly feels like the show was killed and resurrected in time for the beginning of this new season. Though we still see many of the same people on screen, this show feels wonderfully new and different, perhaps even reborn. Stepping back for a moment: the first two episodes felt considerably better than season one’s, but they were limited by their need to establish the transition away from season one and it wasn’t until episode three that I was really sold. In this case, “sold” includes me cackling and clasping my hands in glee. There have been better and worse parts of the episodes since then, but they continue to leave me excited. It’s almost a shame that season two builds so much on the context created in the first season, because you’ll have to watch the first season if you want to really know what’s going on between the characters. I mean, maybe you could get by without it, but you also might miss a good deal that is simply referenced in passing. Agents of SHIELD doesn’t occupy that category of stellar TV shows which are unassailably good right off the bat, but it seems to me that the foundation is being laid for a much longer story which should gradually grow in complexity and appeal. To be honest, I think I may prefer it this way, provided it pans out: a carefully designed and cultivated story that grows into an excellent favorite would be much better than something that starts off promising only to go sour. I didn’t think that I’d nearly abandon it before it improved, but all’s well that seems better at the beginning of season two, right? I’m sure that’s how that quote is supposed to go. So, there’ll be no spoilers or anything else like that in this post. I just wanted to say that, in case you dropped it in distaste at the end of last season, you may wish to give SHIELD another chance. At least for a little while, until I have the chance to change my mind again. 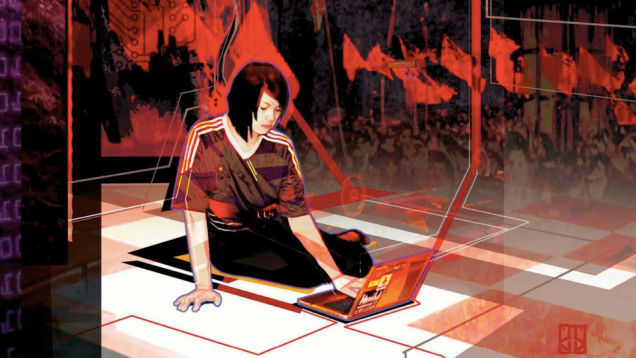 Eastern European politics (both Soviet and post-Soviet), color revolutions, spy games, long hidden family secrets, and a quiet sci-fi premise? Sign me up. Ken MacLeod‘s The Restoration Game gives all of that, plus a little bit more. Maybe that’s why I liked it so much. It’s a quick read, with an engaging and easy-to-follow female protagonist who, as the story unfolds, comes to feel like the appropriate scion of all those who’ve come before her. I’ll explain that, I swear. The book gets bonus points from me for having a female narrator; I’m writing a piece with a teenaged female narrator (as I’ve mentioned previously), and everything is grist for the mill. And I should note that while I quite liked Lucy’s narration in The Restoration Game, I’d love to hear women’s opinions of the narrator’s experience and voice in this book… I don’t exactly have a good frame of reference by which to judge it. About that scion comment: our protagonist, Lucy Stone, opens the story with a cliffhanger and no context. It works well, catching you quickly and pulling you in, and then the entire book becomes an extended digression to give the context for that scene, only finally reaching resolution (appropriately enough) at the very end of the piece. At the beginning, you have no idea of what Lucy has been through, what her family history is, or what she is capable of… but by the end, things fall wonderfully into place. It’s wonderfully done, and flows smoothly from start to finish. Ok, that wasn’t quite right. There’s still that initial sci-fi premise, right at the very beginning of the book before Lucy ever has a chance to speak, and I bounced off it the first two times I opened the book. It wasn’t bad, it just wasn’t what I thought I’d set out to read and wasn’t nearly as interesting to me at the very beginning as it was by the very end. After some reflection, I think MacLeod placed the introduction of the sci-fi premise correctly; there really isn’t a better place to put it that makes more sense and doesn’t disrupt the story further. Without that initial introduction, later elements of the book would make very little sense and feel insufficiently well signaled (here we are back at the perils and prerequisites of good foreshadowing). MacLeod clearly set himself a difficult project, possibly without realizing that he was doing it, but I think he managed to do a good job of it. It looks like this post isn’t even going to have a break. The Restoration Game is fast enough and internally intricate enough that I don’t want to ruin anything for you by accident, so I won’t bother with the usual danger of discussing potential spoiler material. Suffice to say that it’s a good book, one worth picking up for quick fun, especially if you’re interested in a jaunt through spy games and epistemological thought experiments. This is yet another post about the YA horror novel I’ve been working on, which I roughly outlined here. Last time I gave you the very beginning of the story (which I’ve already altered again); this time I’m going to give you the very end of the story. This ending will undergo further changes: I already know that I need to decide whether it makes sense to have italicized thoughts-of-the-moment within the narrative, and if I like them, decide how to alter other story sections to incorporate them holistically rather than as a last minute deal. In my case, Lee Child’s cover blurb is highly inaccurate. Assuming that he includes himself in the group he describes, I’d guess Lee Child hasn’t read many superhero stories; he certainly should be familiar with a number of the other elements involved in Sakey‘s Brilliance. The book is an excellent combination of superhero fiction, “spy” thriller, and semi-dystopian intrigue, and while I haven’t read many books that combine all of those elements at once, I’m certainly familiar with each of them individually. That familiarity leaves me well positioned to appreciate the skill with which Sakey unwinds his plot. The story is set in a world in which some people (1% of the population, more or less) are extremely capable at pattern recognition, generally focusing on a specific subset of their environment. Our protagonist, for example, is able to read people’s immediate intent through their body language, making him fabulously good at telling where people are going to move within the next few seconds, and at telling whether or not someone believes what they are saying to be true. This basis for superpowers is simultaneously remarkably constrained and very wide-ranging. It doesn’t make people superhuman in immediately noticeable ways, and Sakey does an excellent job of keeping to his original concept without breaking the plausibility of the setting. This is a fast and fun book, and an easy read. The main character is a quintessential representation of The Man, and the story offers pulpy action goodness, with a thick helping of intrigue, implicit duplicity, and lies. If you enjoy quick reads that deal with a moderately dystopian alternate present filled with superhumans who are indistinguishable from the rest of us, and all the problems that entails, then I suggest you pick up this book. You may want to pick it up even if those keywords don’t set your Must Read alarms buzzing, but I’ll save any more description for after the break, where I keep all my spoilers. Also, just to warn you, this book definitely deals with racism and the abuse of authority. I think it does it decently, you may think differently. I don’t think you’d mind it, Stephanie, but I also don’t know that you’d identify with the narrator at all. Like I promised, I’ve got some actual text for you today. 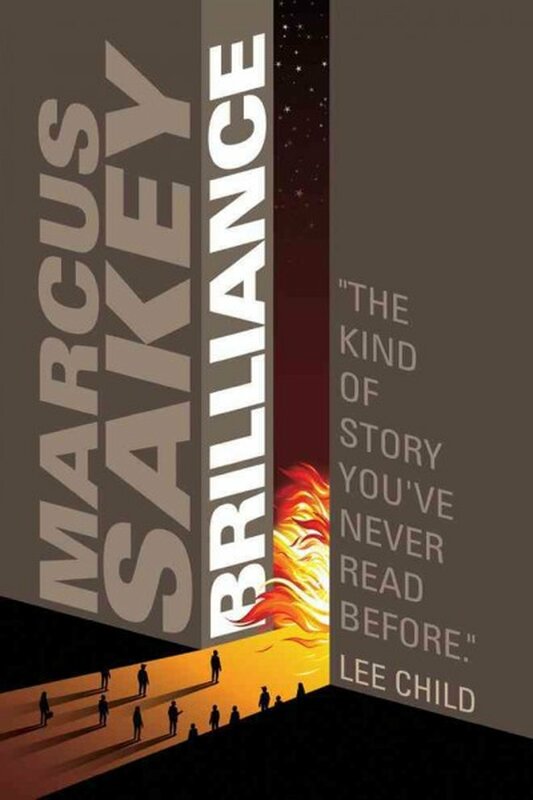 I’m a bit late because I’ve just finished pounding through Marcus Sakey’s Brilliance, which I rather liked, but hopefully this material will make up for it. A number of years ago, one of my writer friends mentioned a story concept that she wanted to share with me. She wondered what would come of a Lovecraft-inspired horror story in which the protagonist was a high school girl who had just recently moved to a new town. I immediately latched onto the idea. We spent a few hours bouncing ideas back and forth, and at the end of our brainstorm session I asked whether she would like to collaborate with me on the project. She said yes. I started writing material for the story, occasionally ignoring school work that I really should have been doing at the time. I soon had a great deal of (questionably valuable) material to share with her, but she’d fallen into a work-hole and been unable to claw her way out. She ceded the project to me, though we continued to share our thoughts on it. Fast forward a few years: after finishing my thesis, graduating, and getting back into the swing of writing for a while, I dust off my old drafts of this nascent YA horror novel and get some other people to take a look. The drafts are, to put it figuratively, mostly made of poo. I’m now aware of the fact that I have little idea of how to write a teenaged female narrator, which makes looking at my past struggles all the more painful. But there are some pieces that seem like they still hold some value. The concept and the basic story beats still seem basically solid, and the story clearly has an excellent ramp up to the climax. Now the time has come to strip the piece down to its bare bones and tinker with it for a while. Oh, and write a variety of new attempts at a teenaged female narrator, while reading as many pieces with teenaged female narrators as I can (preferably from the right genres). In case you’re wondering where this is going, yes, I’ve got some material to share with you today. There are lots of things to like about the Avatar series. I find it hard not to like excellently conceived and delivered all-ages content, especially when it does little to dumb down what it has on offer just because kids will be watching. 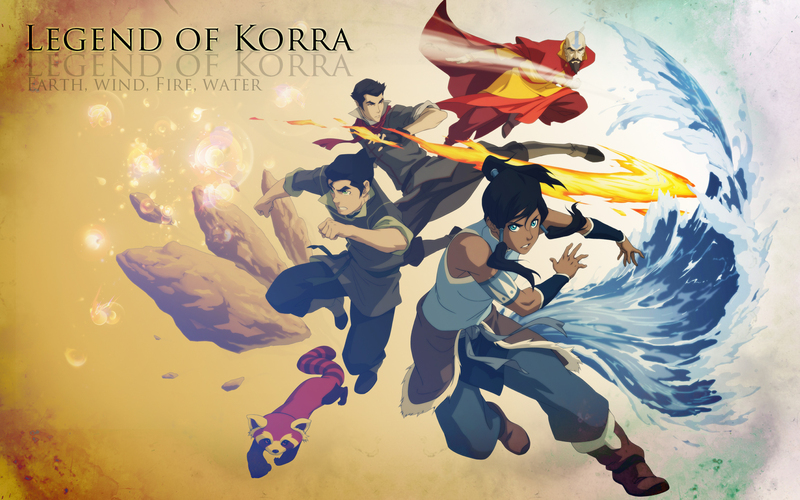 Both Avatar: The Last Airbender and Avatar: The Legend of Korra have ultimately delivered that, and at this point I’m definitely a fan (*careful, that link goes to Nickelodeon’s streaming site, and there’re potential spoilers on the page*). I’ll admit that for a while I was much happier with the first series than with the second, but Korra has been growing on me. Most of all, I’m really happy about season three and very excited for season four. Please be aware that I’m going to spoil bits of seasons one and two for you here. If you haven’t seen them, I’ll put it like this: they’re not as good as they could have been, but they have their own wonderful moments. Better yet, they set the stage for excellent things to follow in their footsteps, and I would certainly say that they’re worth watching because of it. And because, you know, there really are some good moments in there. I can identify the plot elements, but I have no idea what’s going on with this cover. I reviewed the first two books in this series last fall (almost exactly a year ago, as a matter of fact), and somehow failed to review the third. 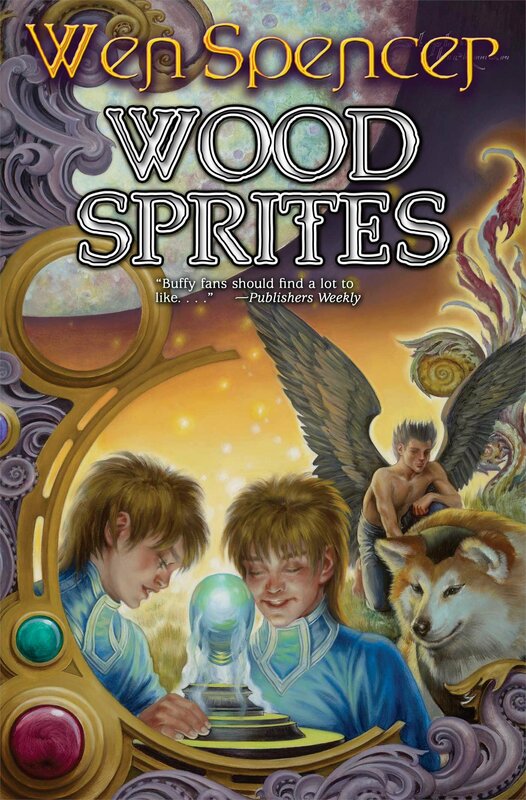 But Wood Sprites, fourth in the series, has just come out, and there was no way that I’d leave it untouched after how much I enjoyed the first few. To be perfectly honest, while the first few books were fun they were also frequently uncomfortable; Wen Spencer includes toxic interpersonal relationships, abuse, and worse trigger-warning worthy things, though from my limited perspective she treats it more honestly than many other fantasy authors do. While Wood Sprites is a far safer read, it still doesn’t shy away from putting its protagonists through a series of terrible circumstances. This feels appropriate, given that the protagonists are 9 year-olds in the center of a multi-generational secret war. Correction: with Alpha 7‘s release, the space magic continues. Or, uh, the starving frontier space magic, beset by violent thugs and now diseases. But let’s look on the bright side of things: even as Ludeon has introduced plague, it has also given us the prosthetics and organ harvesting and transplantation, in addition to a welter of other neat new features. My Alpha 6 colony had a slowly growing number of people who’d lost appendages to chronic cases of gunfire and explosions. I was forever terrified of having my wonderful and productive citizens maimed horribly while defending the colony. Now, it looks like we can give our debilitated friends a leg up, so to speak, by building prostheses for them to replace whatever they’ve lost. Given the constant scarcity of more advanced medical supplies, I foresee specifically targeting raiders with cybernetic prosthetics so that I can strip the things I want from their cold, dead bodies. Or from their warm and unconscious bodies, if they somehow survive the fusillade of bullets and seem like they aren’t worth rehabilitating. 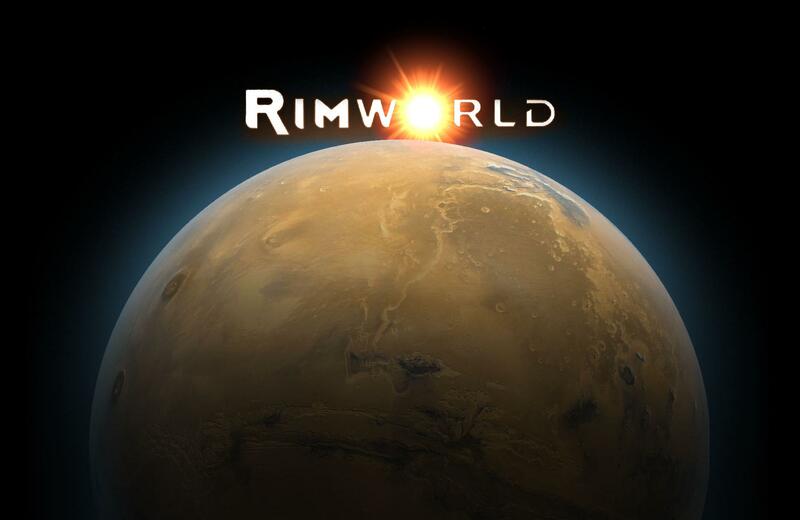 This is Rimworld, after all, and I already do my best to hunt down fleeing raiders when they’re wearing or carrying things I find especially desirable. It’s hard to come by powered combat armor without taking it off the body of an erstwhile attacker. Traits have already made a meaningful entry into the game, affecting everything from move- and work-speed to mental stability and opinions of cannibalism, and there’s nothing quite like having a murder-happy speed demon ready to hunt down your fleeing enemies. You just have to make sure that they never suffer a mental break or suddenly decide to betray you.